No Next Time, No Second Chance, No Time out. This is an inspiring story of a pioneering African American woman doctor fresh out of residency training. In 1975, Cornelia Davis, MD sought a way to give back for her life’s opportunities. Her bold choice would benefit millions of lives. The World Health Organization hired Dr. Davis to work in its landmark smallpox eradication program. Connie traveled to India, where she scoured the countryside for the last remnants of the brutal, deadly disease. Connie didn’t allow entrenched sexism, or caste taboos to deter her from her fascinating mission. She tracked smallpox through the Thar Desert on camelback and across volatile Indo-Bangladeshi borders. She negotiated with smugglers and fakirs. She met Mother Theresa. She climbed to the base camp of Mount Everest. Finally, her symbolic search for Sitala Mata, the Hindu smallpox goddess, came to a positive conclusion. An international certification team declared smallpox eradicated in India. To this day, smallpox is the only disease that’s been completely wiped out. Dr. Davis played a role in stopping a pestilence that’s dogged humanity for thousands of years. 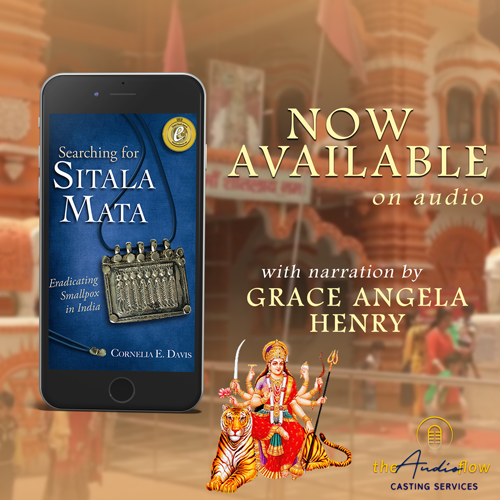 Searching for Sitala Mata is the story of how one brave woman’s simple desire to pay it forward had historic and positive ramifications worldwide.